Yesterday I spent some time stripping the gardens of spent plants, including our two huckleberry bushes that were not bare, but needed to be gone. I picked a good 3+lbs of ripe organic berries before pulling the plants and rehoming them in our compost bins. If you've ever tasted fresh raw huckleberries.... well... yuck. We don't like them. 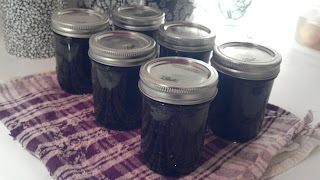 I used the berries today to make several half pints of organic huckleberry preserves, which is far from yuck. In fact, The Boy has deemed this our best preserves recipe ever, so I feel obligated to share. :-) Please note that this is a combination of several recipes I have found, so I give open credit to the entire planet in order to cover all bases here. -Put huckleberries, zest and water in blender and puree the heck out of it. Don't splatter paint your white kitchen with purple huckleberry juice like I did. Pretty, but unnecessary. -Transfer to pot, add lemon juice and pectin and bring to a rolling boil (rolling boil means stirring doesn't stop the boil). -Add sugar and butter, stir to dissolve, and bring back to a rolling boil for 1 minute. -Fill half pint sterilized and heated jars, put on lids and process in a water bath for 15 minutes. Remove, allow to cool undisturbed. Do you have any huckleberry recipes? We'll definitely be planting more of these no maintenance, prolific plants next year. Ours were ignored all year and thrived... plus, the chickens don't seem to like them, which is a major bonus.